1. 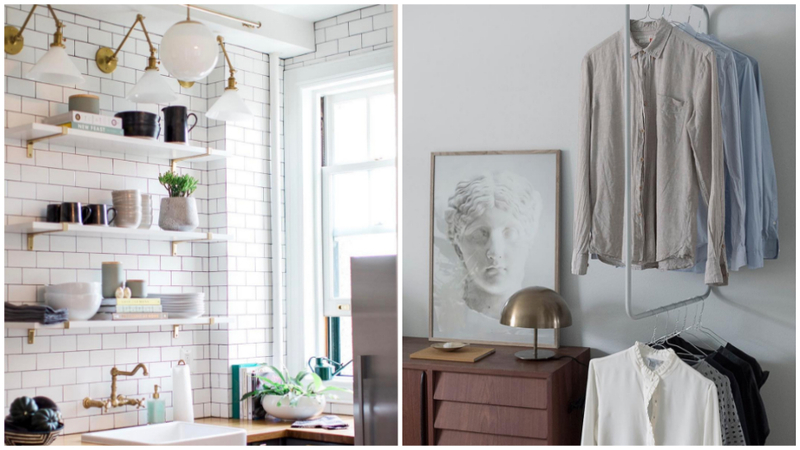 Every wall is a potential spot for shelving. Don’t waste an inch of vertical space by installing additional shelving wherever you can. Aside from giving you a ton of room for storage, it won’t make your room feel cramped unlike traditional kitchen cabinets as open shelving still keeps the air free flowing. 2. Don’t forget to maximize horizontal spaces, too. When you’re living in tight quarters, it’s important to showcase things that make you smile to help divert the eyes from the size of the space. Make room for succulents, photographs, and knickknacks on empty table surfaces and use it as an opportunity to display your favorite things. 3. Transforming furniture is key. Instead of trying to fit in a multitude of pieces into your compact home, look for things that serve more purposes than one. Not only will it help you save space, transforming pieces also keep you active with the folding, pushing and assembling required—it’s a win-win situation! 4. Don't be afraid to make a statement with decor. One common misconception about decorating a small space is that you can’t use huge, statement pieces. With a little inventive floor planning and the right accessories, accent pieces can visually stretch a room. Using light colors and simple patterns can help you, too. 5. There’s always room for a closet. Never underestimate what you can do with a nook, the space under a lofted bed, or the gap between a table and a wall. Squeeze in closet space by getting creative with racks, shelving, and hooks around your home.